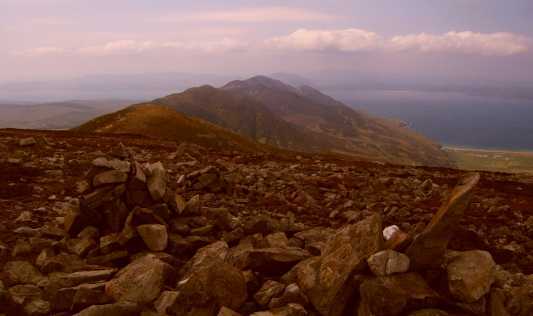 This mountain has a megalithic cairn and circles at the summit (Colhoun). It is known as Raghtin on the Buncrana side and as Coing (meaning 'roof beam') on the Urris side. 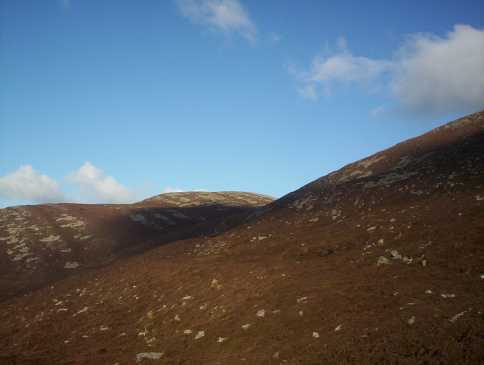 Raghtin More is the third highest mountain in the Inishowen area and the 562nd highest in Ireland. The easiest approach is to park at Urrismenagh viewpoint carpark C317 443 A and follow the track to its highest point. From here you can avoid Crockmain and carry on towards Raghtin More to the North. Alternatively from Mamore Gap car park C323 423 B walk downhill in a SE direction to a gravel track and follow it to the head of the valley before veering off to the North to reach the summit dirctly by avoiding Crockmain. From the North East park at Butlers Glen C358 468 C with off road parking and walk up through the Glen to the end of the track before ascending over open boggy hillside. There is a large cairn on the large flat rocky summit area. 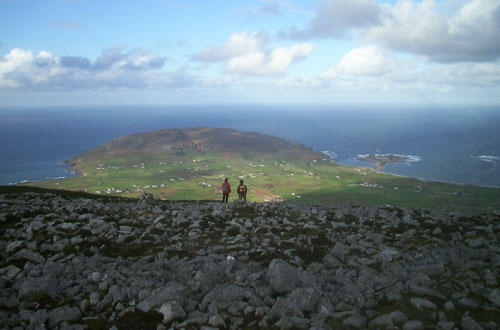 The best route for a medium walk is from Mamore Gap. Use the car park/layby located on the left of the road, 200m from the top of the Gap on the southern side. From here walk downhill for 200m to a small group of trees and a gravelled track heading into the valley. Follow the track to the head of the valley just below Raghtin More. From here you veer slightly left over the heather and turf banks to reach the saddle between Raghtin More and Slievekeeragh. Keep climbing heading diagonally across the slope to avoid climbing the small summit of Crock Main and you reach a small flat area before the last 100m to the summit. There are lots of rocky patches on these slopes, heading to the right misses most of them. On the large flat summit plateau there is a substantial cairn which can seat about 8 and provides soem wind shelter when it blows!! 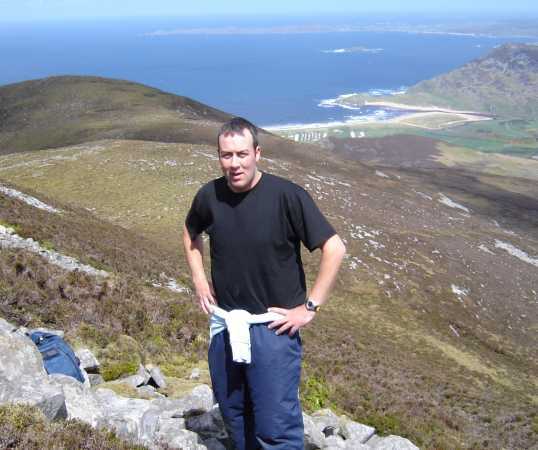 There is also a trig point and of course excellent views from Malin Head to Errigal on a clear day. On the way back either..
A) Retrace your steps to reach the path in the valley. 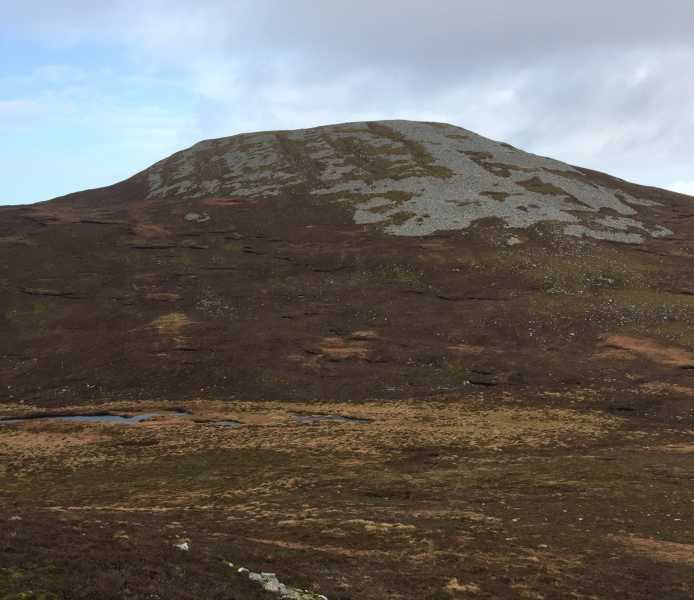 B) Climb Crock Main (460m) and Mamore Hill (423m) which adds about another 150m of ascent and is a lovely trail to take you out just at the top of the Gap and it is a short walk downhill to the car park. Started at Butlers Glen (358468 C) which has off road parking and other facilities. A lovely walk up through the glen crosses the river a number of times with the sound of burbling water as a constant. An army of ferns were pushing their way skyward in the late spring sunshine which only reached part of the deep sided glen. Views down the glen reach to BInnion Hill and Tullagh Bay on the coast. Rounding a bend the spectacular waterfall comes into view. Climb steeply out of the glen to the left - would be a nightmare in the wet! Join a track heading further up the valley for a short distance before dropping down (again steeply) to cross the river. Open hillside leads to the objective of Raghtin Beg ahead. The ground was spongy and would be very wet normally - was a bit of a slog to be honest. I did see a frog and a newt - a bat would have completed a perfect recipe for Shakespeares witches. Clouds were forming off the sea in the E wind leading to overcast and windy conditions on top of Raghtin Beg whilst the surrounding coastline bathed in sunshine. Views to the double horseshoe bays northward were spectacular. A short but steep final climb brings the top of Raghtin More. There is a massive cairn with other lesser effortsdotted about. Views to tthe E are taken up by the height of Slieve Snaght and Crockmain. To the W Lough Swilly with Fanad lighthouse at its head is in view. As move across the top the spectacular line of rugged tops heading S take the breath away, along with the never ending reaches of L Swilly with its occasional golden beaches.